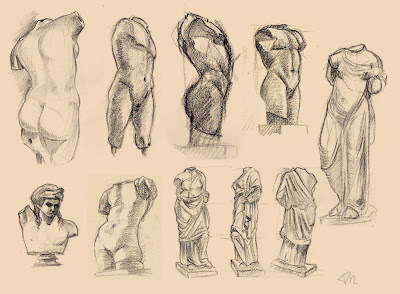 I had a great opportunity to accompany a sketching trip to the ROM in Toronto. This was part of the 3rd year Digital Sculpting / Zbrush course taught by my husband, Phil Bonner. I have to say drawing statues was the perfect bridge between being rusty at life drawing and actually going life drawing (soon, soon...). Those statues are excellent models - they hardly moved at all! I'd love to go sketching there again and maybe hop down to the Biodiversity gallery to sketch some (also immobile) animals.